It has been a long, short week. So much was packed into four days. This week was filled with reading and writing assessments. Assessments keep me up at night for many reasons. I wrote about the pain of inappropriate assessments on Tuesday. But on the flip side, results of assessments, when viewed with understanding and as a marker of growth on a continuum of learning, are reason to celebrate. This week I saw my students’ thinking as they wrote about their reading. I saw how each student approached the text. I saw growth and meeting of benchmarks. This matters. Students need to see their growth. But more importantly, teachers need to find next steps for students. So I record their scores to track their progress, and set that aside. What I spend time with and celebrate this weekend are the areas of need, the next step for each child and the puzzle of how to get there. Our informational writing unit came to an end and students celebrated by commenting on each other’s posts. Students tend to notice the mistake rather than the strength or comment so generally it means very little. I wanted them to not only comment in a positive way, but to learn something in the process. 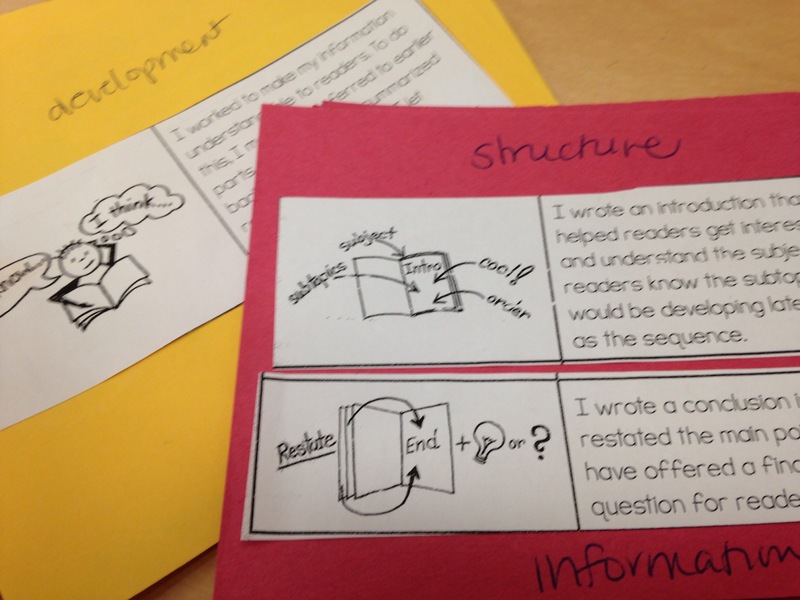 Taking a tip from Melanie Meehan, I cut up our TCRWP checklists and put them on cards . Then, I invited students to find something a student did well that was on a card and complement them, by identifying what they did as a writer. After working on these for a while I found myself calling them “complement cards.” I started to ask students, have you written a complement or a connection to a post. Inadvertently I had renamed our work. This week I celebrate the renaming of comments. We no longer comment on posts, we complement or make connections. At the end of any writing unit I ask students to write an on demand piece. I invited them to write about any topic they felt they are an expert in. Their only constraint was the time, 45 minutes. Without prompting, many pulled out their genius hour notebooks, filled with notes on their passion projects. One student asked, can we put this on the blog? Never have I had a student ask to put an assessment on the blog. This week I celebrate the power of genius hour learning: time students choose what they want to learn. Given opportunity, resources and choice students can create their own learning. All this week my students wrote about their one little words. So much has come out in this process. Their posts are raw, exposed. The choices they make are so telling. The reason why I choose powerful is because if I do something hard I could look at my word, then it will tell me that I am brave and that nothing is going to take me down. It will also tell me that I am brave and I won’t back down and if I struggle a lot I can look at the muscle and that means I am strong and I am very powerful. So that’s why I picked it because sometimes I struggle a lot, so that’s why I picked the word, so it will make me brave and my word. I know some people struggle with stuff and adults also struggle a lot, so I picked it because I knew it would help me and make me better when I am working. And if I get stuck I can look at it and it tells me I am strong I can beat any hard stuff and it will make me confident. Now I like the word and I love the word😊 because I know it will help me throughout the year of elementary so yay👍. So yay and happy weekend! Such great learning in your post!! The writing around OLWs is powerful and brave indeed! If only everyone worked so hard and celebrated their students’ achievements like you do. You put your students first. They are growing because of this. Thanks for sharing all the special ways you encourage your students. Honored to be part of your post and your celebrations this week, Julieanne! I love the idea of using the cards so that kids identify what others are doing well! Great idea! Yay! What beautiful celebrations Julieanne. Feedback it seems is often focused first on what is missing or could be better. I feel like that is a lot of the work of teaching and learning that we all learn best when our strengths are highlighted. How perfect to guide your kids to compliment and connect! Lucky students. May it keep them powerful throughout their schooling! That matters. That is a true gift. Thank you for sharing the positive sides of assessment. We are in the thick of it and I was getting bogged down. Your reminders are just what I needed. Each celebration speaks of a growth mindset in your class. That is powerful learning for life. Yay to you and the learners you guide everyday. Wow- you had a week full of wonderful moments. I love what your students chose to do with their on demand writing assessment. I appreciate your reflections and insights here. Assessments that impact what next thinking are indeed worthwhile. Always so much to learn from you Julieanne! The words from your student about their OLW are so powerful and amazing! I love all of your reflection on assessments too. Thank you for always teaching me something new! I love every bit, Julieanne, but will take away that idea of “complement and/or make a connection”. My students have just begun blogging & they’re slowing down with the comments. I think they need a nudge & some additional conversation/instruction. Thanks very much! Julieanne, There is so much to celebrate in your post! I would have loved to have been a student in your class this week. Kudos to you for moving beyond scores to next steps with your assessments and replacing comments with compliments.